I am staying with my daughter for a month and she has a Bell Boy Pepper plant that was getting too big for the small pot it was in, so I transferred it to a larger pot. I used Miracle Grow potting soil and put it outside on the covered front porch. Within days it shot up 2-3 inches and it is now covered with little buds. The directions said to keep well watered, so I water it every day. The problem is that the 3 fairly good size fruits are starting to rot before they are full grown. Also, they are not turning red as specified on the tag. Can someone please tell me what I should do to prevent this from happening to the rest of them? P.S. I have also had this problem with large size tomatoes in the past. Thanks, Lori. Answer: Lori, you did not specify where the rot begins, so there are a couple of things that could be happening. If they rot starting at the blossom end, it could be blossom end rot. 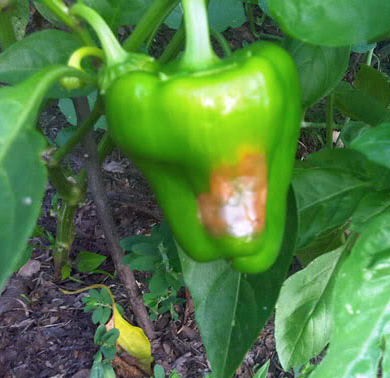 On peppers, the affected area usually appears tannish in color in the beginning and then will turn dark as secondary molds appear. It can occur on the sides of peppers, but it’s generally at the blossom point. Blossom end rot is due to a calcium deficiency in the plant. This can be caused by various reasons, soil moisture fluctuations, or over-fertilization with a high nitrogen fertilizer. You mentioned using Miracle Grow soil and it comes with fertilizer built in, high in nitrogen, to make plants grow quickly. It’s a good practice to always check the soil moisture before adding water. It might be that it doesn’t need it or it could need moisture twice a day to keep it evenly moist. Container growing can be tricky, especially with the heat we’ve had this summer. A good fertilizer for peppers would be HyR-BRIX® Tomato and Pepper Fertilizer. In the future use a container soil mix that has no fertilizer added. I suspect you are experiencing blossom end rot since Anthracnose Fruit Rot, a fungal disease, is a little less likely in container plants, but not impossible. In this disease, the lesions will develop as circular or angular sunken spots on developing fruits; you might also see spots on leaves and stems. It can be spread from overhead watering or watering late in the day when the plants do not dry before sundown. For this there isn’t a cure other than to remove and destroy diseased fruits and plants. You can compost the remaining soil if no plant debris remains and your compost pile does heat sufficiently. As for the coloring, they will start green and stay that way until they reach mature size, then develop their red pigment somewhere between 10 to 28 days for full color. They, like their relatives the tomatoes, are sensitive to temperatures, so they might be waiting on some cooler temps to finish their maturation. The tag on the plant should give you an indication of days to maturity, which will give you an idea of when to start seeing color shift. Good luck with your peppers, and happy gardening. What Size Container For Peppers and Tomatoes? Can I Put Coleus In An Inside Window Box?